Whether you're an experienced scuba diver or a beginning snorkeler, exploring the underwater world off the coast of Cozumel is truly an unforgettable experience. But what makes our island the world's top scuba and snorkeling destination? Find out below - and start planning your trip to Playa Mia today. Why Is Cozumel Great for Scuba Diving? The second largest barrier reef system in the world, the Meso-American reef, is located right offshore. Almost all the dive sites in the area are located in the protected waters of the Cozumel Reefs National Marine Park. Cozumel's waters are home to 26 types of coral, over 500 species of fish, and several species of sea turtles: loggerhead, hawksbill, and green. Super diverse diving sites abound, from secluded coves with gentle waves to current-swept drift diving experiences. Waters are warm and underwater visibility is usually excellent. On top of all that, Cozumel also has friendly locals, amazing good, vibrant nightlife, white beaches, and rich local culture. 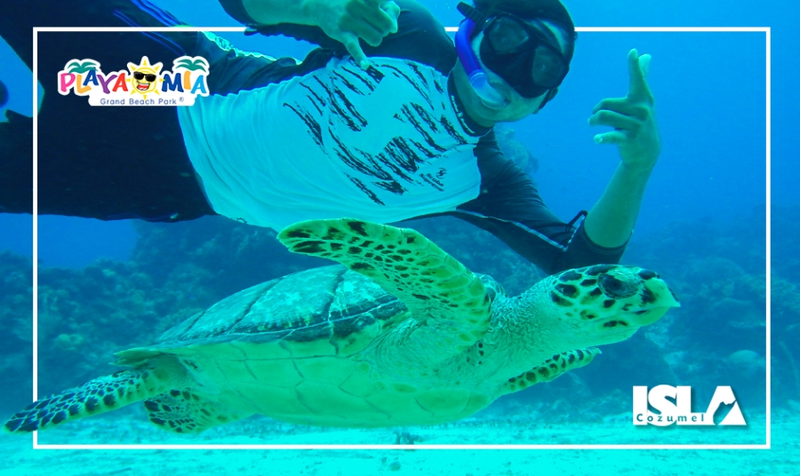 Experience the world's #1 scuba and snorkeling destination for yourself on a Cozumel Snorkel Tour from Playa Mia. Do you have questions? Please contact us today.